A friend met me for dinner at Wolfgang Puck Express on Cool Springs Blvd. in Franklin. Though both Starbucks and Carabbas on either side were busy, the Wolfgang Puck Express was curiously quiet. …but what about the celebrated Wolfgang Puck menu? 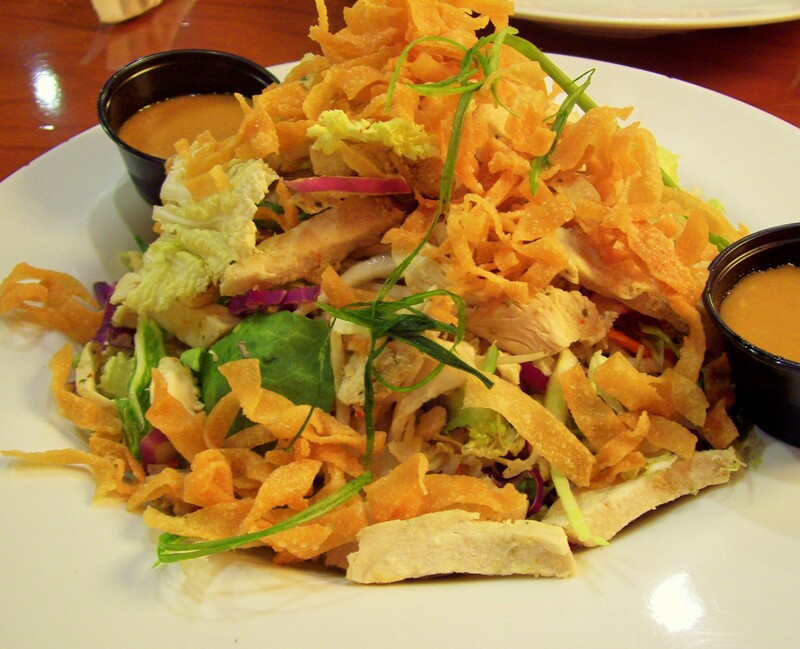 Could the Wolfgang Puck Chinois Chicken Salad ever live up to its hype? And did you notice how they include the correct pronunciation of “Chinois” on the menu itself? We were a little confused when we first entered the restaurant. You order and pay at the counter, choose your own drink, and seat yourself. Then, a waiter brings the food from the semi-open kitchen. You can watch the flames shooting up from the Wolfgang Puck Express grill. Our waiter circled continuously, which puzzled us. Why don’t they let the waiter refill your drinks, then? We thought the semi-service concept was a little off. Maybe we’re just used to Panera Bread. The Chinois Chicken salad ($8) was tasty, with an attractive presentation. Mine was a pile of shredded cabbage and romaine, with soft chicken and hard wonton strips. The Wolfgang Puck honey mustard dressing was tart and sweet, but not enough to cut the slight bitterness of the cabbage. —>Guess what? I found the official recipe for Wolfgang Puck’s Chinois (Chinese) Chicken Salad! I may try making his Chinese Mustard Vinaigrette at home. My friend ordered the linguine with basil marinara, only she substituted penne for the pasta. We used a Wolfgang Puck Express coupon from the Nashville Citipass book, bringing the total for two entrees to $9 plus tip. 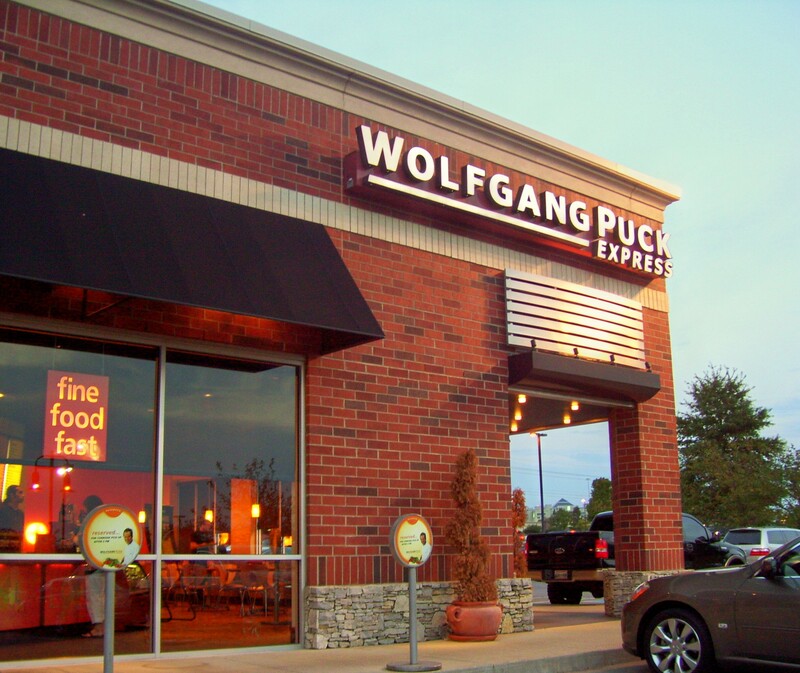 Would we eat at Wolfgang Puck Express again? Perhaps. Next time I would try one of the grilled meat entrees or fish instead of the salad. The atmosphere was quiet, the booth comfortable. If the food didn’t knock my socks off, at least my company was superb!